The source of my phyto-photo-dermatitis: cow parsnip. Photo by Don Garlick. This is a story of accidental scientific rediscovery. 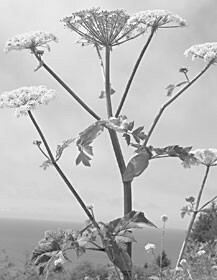 The photo above shows a common coastal perennial plant named Cow Parsnip. Last spring I picked its large leaves to mulch redwood seedlings. During the next few days I watched a mild redness on my arms develop into a handsome tan. Discovery by accident is termed “serendipity,” and a famous example is the fortunate contamination of Fleming’s petri dish by one stray spore from a Penicillium fungus. His bacterial cultures died near the growing fungus. Penicillin subsequently saved millions of lives. With visions of making a fortune from herbal tanning creams derived from Cow Parsnip, I conducted further experiments on my arms and legs. My covered legs had no reaction to the sap, but my sun-exposed arms developed severe sunburns, followed by ugly tanning. I then learned from the Internet that “phyto-photo-dermatitis” followed by “hyper-pigmentation” are well-known reactions to some members of the Umbelliferae family of plants, such as Cow Parsnip. And such sunburns increase the chance of skin cancer. Fleming received a Nobel Prize; I ended up with a painful rash! Although my dreams of tanning creams were dashed, others have prospered by treating skin disorders such as psoriasis (red patches) and vitiligo (white patches) by applying psoralens, the active ingredients from this family of plants, accompanied by exposure to ultraviolet light. When activated by light, psoralens become toxic by entering DNA and binding tight its two strands. Why did phyto-photo-toxins evolve? While it is obvious how stinging nettles deter browsers, the benefits to Cow Parsnip of delayed sunburns are not obvious. It is possible that herbivores could learn to associate this plant with subsequent painful reactions, even if the reactions were delayed by days, if the animals continued to eat the plant for several days. Of course, nocturnal Parsnip-loving bears remain ignorant. Consider the selection pressure on Cow Parsnip: One plant produces thousands of flowers and twice as many seeds. In a stable population, an average of only one of those seeds succeeds in producing a mature plant. Competition is so intense that a gene conferring even a minor benefit could prevail. It occurred to me that plant-eating insects may have been the critical agents driving the evolution of psoralens. After-all, insects also contain vulnerable DNA and are exposed to the sun. But insects evolve quickly and are likely to develop countermeasures, as exemplified by the ability of black swallowtail butterfly larvae to rapidly detoxify psoralens. What other strange plants lurk in our environment?